Making Greenland wax for waterproofing outdoor gear is very easy and inexpensive. The materials needed are parafin and beeswax. I have used parafin meant for making candles from a craft store which has a melting point of about 60 degrees. Beeswax can be found from some craft stores, but it is cheaper to ask for it from a beekeeper. 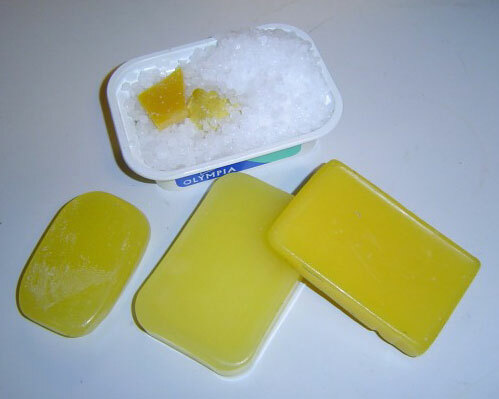 Both parafin and beeswax are usually sold in 0,5 - 1 kg pieces. From 1 kg you can make 20 pieces of Greenland wax, which is enough for all your friends as well. The process is very simple: melt parafin (about 90%) and beeswax (about 10%) in a container which is placed in a hot water bath. I have used a pot of water on the stove for this, in which the water was first boiled and an empty cream cheese container was used as a form (as seen in the picture below). After melting let the mixture cool down. Afterwards the wax is ready for use. In experimentations I haven't noticed any difference between the factory wax and the self-made wax. On the left factory made wax, on the right homemade wax and above parafin and beeswax ready to be melted.